Attention: Deliveries to Washington state will have a 9.5% sales tax added! Our ULTIMATE Gas Scooter: Signature Series (A-Blaze) 50cc 2 Stroke XG-575-DS. The XG-575-DS comes standard with a EPA certified gasoline engine and a Puzey Patented 2 Speed Shifter Transmission. This gas scooter can reach speeds up to 35 MPH. 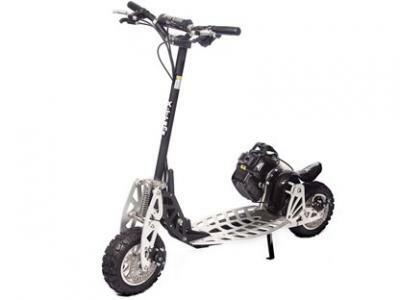 The features of this fast gas scooter include an Aluminum Billet deck and 11" KNOBBY air filled tires, (this is the ONLY scooter of this type available with oversize Knobby Tires) and this tough gas scooter also comes with a Patented Front Mono Shock Suspension System which will aid in a smooth ride and soft landings when jumping. The XG-575-DS has racing handlebars with a foam center pad signed by A-Blaze (Signature Series), front and rear vented disk brakes, the widest billet CNC cut deck available, and a Fold-N-Lock system which allows you to quickly fold the handle pole down for easy transportation or to load into the trunk of a car. The XG-575-DS has an optional Puzey Patented Snap-N-Click seat kit should you want to add that after your purchase (sold separately).